Chairman Pakistan Telecommunication Authority (PTA), Dr. Mohammed Yaseen presented cheque of Rs. 201.43 million to the Prime Minister, Syed Yousaf Raza Gilani for the “Prime Minister’s Flood Relief Fund 2010 for the Assistance of Flood Affected People”, established for the relief and rehabilitation of flood affected people. The amount included Rs. 200 million contribution by PTA, Rs. 0.65 million of one day salary donated by PTA employees and Rs.0.78 million collected through 1234 SMS service. Chairman PTA along with Secretary Cabinet, Mr. Abdul Rauf Chaudhary presented cheques for donation during a meeting with the Prime Minister. PTA is also engaged with the telecom operators for the prompt restoration of telecom networks in flood-stricken areas. It has started 1234 Service to collect donations through SMS. Subscribers can send SMS by writing “Fund” to 1234 and each SMS would contribute Rs 10 to the fund. 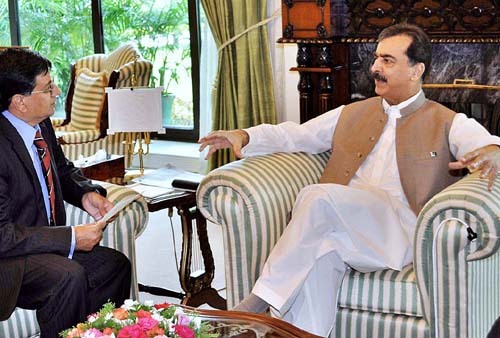 Prime Minister Syed Yusuf Raza Gilani urged the Chairman Pakistan Telecommunication Authority to ensure the reconstruction of telecommunication infrastructure in the flood-hit areas to strengthen the relief activities. The Prime Minister appreciated the gesture of PTA employees who contributed one day’s salary to help their distressed brethren in flood-hit areas. The Chairman PTA apprised the Prime Minister of the damage caused to telecom infrastructure in flood affected areas and also various ways devised by PTA for early reconstruction of the network. I really appreciate for donating funds for relief of flooded peoples. Qaum apko naukri pakki honay par mubarik-baad paish karti hai. Quality of Service ka khawab dekh kar Geo. It’s really easy to donate £5 to the DEC Pakistan flood appeal. Just text GIVE to 70707. Texts cost £5 plus your standard message rate, and 100% of the donation goes to the Disaster Emergency Committee (DEC), which is an umbrella organisation for 13 humanitarian aid agencies including the British Red Cross, Oxfam and World Vision. Sending the text will only take a few seconds, but every single donation will really help the people of Pakistan when they are in such desperate need. So send your text now, and let’s make a difference. Thanks bro for this. Hope readers in UK will contribute. Rs. 200 Million wasted if they’ve given it to PMRF. Salute to Pakistan Telecommunication Authority from Tradeeight.com These kind of behavior shows that we are muslims as Muslims cannot see their brother in difficulty.